SURPRISE IN BELGIUM: LEFT-WING GOVERNMENT FUNDS ANTI-SEMITIC BIGOT MUSLIM SUPREMACIST GROUP……. – The Tundra Tabloids……. Senator Alain Destexhe (MR) demanded on Sunday that all public support for MRAX (Movement against Racism, Antisemitism and Xenophobia) be stopped. He denounced the presence of Nordine Saidi in the association’s office [ed: Saidi is on the board of directors], saying that he was an activist of radical Islam. 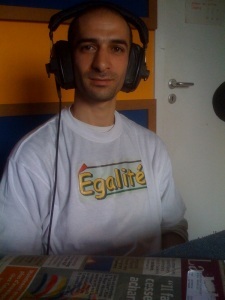 Saidi headed the Egalite list [ed: equality without parenthesis] in the regional elections (June 7), a small, controversial party which included former activists of PTB (Belgian Workers’ Party) as well as supporters of radical Islam. Interviewed on May 17th on parlemento.com, Saidi refused to condemn Palestinian terror attacks or those committed on Sept. 11th. “I understand suicide or terrorist attacks without necessarily justifying them. In any case, I refuse to condemn them if we can’t speak about their causes. Yes, I refuse to condemn terrorist attacks! (…) To prevent these attacks, it’s necessary to have dialog with all parties. If we want to prevent attacks, we’ll have to one day accept talking with Bin Laden,” he said. MRAX is an association financed by the government, said Destexhe and journalist Claude Demelenne, co-authors of a book denouncing certain leftist circles of indulging radical Islam. According to them, it’s unacceptable that this support benefits an association which has such a person in their office. They demand to suspend funding until Saidi resigns from MRAX. Previous Post Previous Post OBAMA’ S HOPE AND CHANGE GOES UP IN FLAMES AS AFGHANS BURN HIS EFFIGY……. Next Post Next Post SIMON WIESENTHAL CENTER TAKES ON NTNU’S DIRTY DOZEN…….